Today is inspiration day It’s the day of the month when a bunch of us get together and share a themed furniture project. The theme this month is “travel”.We each interpret the theme in our own way. I really miss living in Florida….the ocean, beach, sand, surf….my friends. 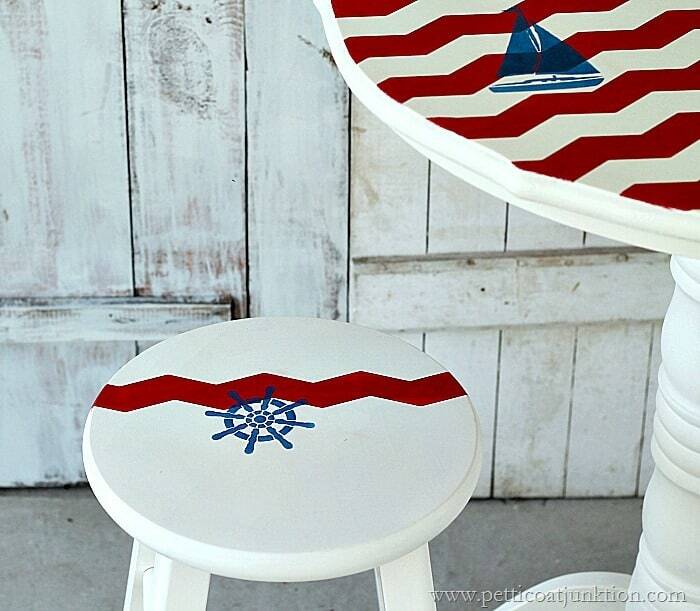 I also love the nautical look….red, white, blue…..clean and crisp So I’m traveling to the ocean today. This is the table the JTS put together for me from two reclaimed pieces. The bar stools came from my kitchen. 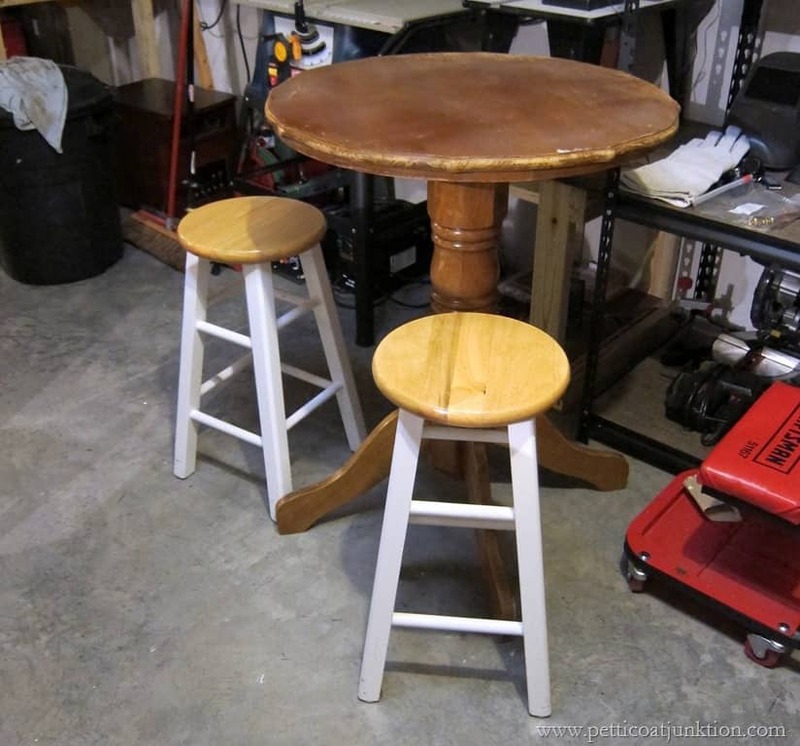 I bought two bar stools from a friend to go with this pub table but the seats were rectangular and didn’t look real great with the round table top. But the stools did look good in my kitchen so I switched them out. Whatever works! I tried not to go overboard on the makeover…ha…just realized what I wrote….no pun intended. I always say there isn’t too much distance between tacky and classy or is that trashy and classy? You guys know what I mean. 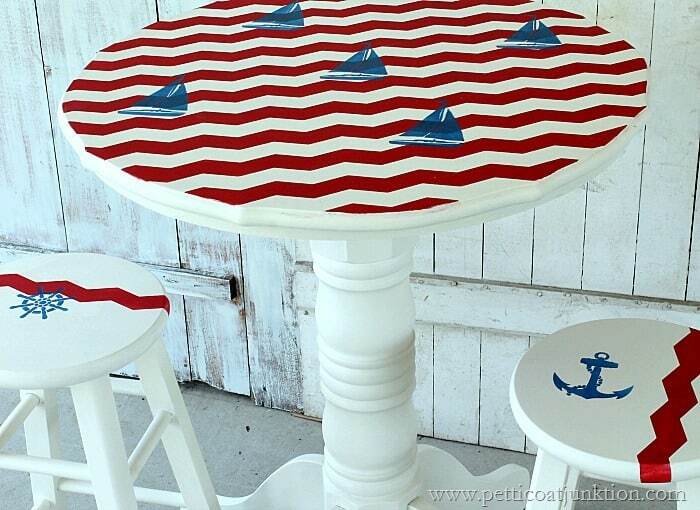 Sailboats on the table top and a little different design for the stools. I’ll have step by step instructions with more photos on the makeover next week. There were just too many photos to add to this post….and not enough writing time. I forget how great red and white look together. What do you guys think? Leave me a little note below. Then take the travel tour below ….. I love how the blue stencil seems to float above the red paint. Look forward to finding out how you did that. Thanks for sharing. Thank you, and thanks for the party invitation! I love it! So cute! Love your creativity! Kathy I love how you can take mismatched pieces and paint them to look like they always belonged together! 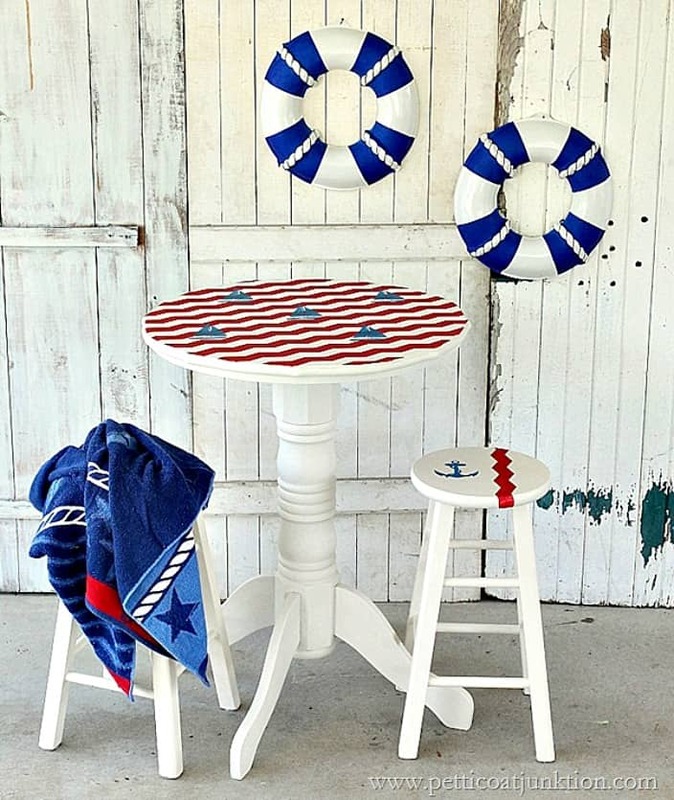 Such a fun set – and patriotic too. 🙂 I’ve always loved red and white together. It may have started because all of my school colors from kindergarten through high school were red and white. They just look so crisp together! Yes Jen, I love the red and white. When I was in school our colors were royal blue and white. I really like red, white, and blue! Wow, that design really pops! And I do think it’s classy. I see stools just like that all the time at thrift stores in my area. Now all I need is a table to go with them! 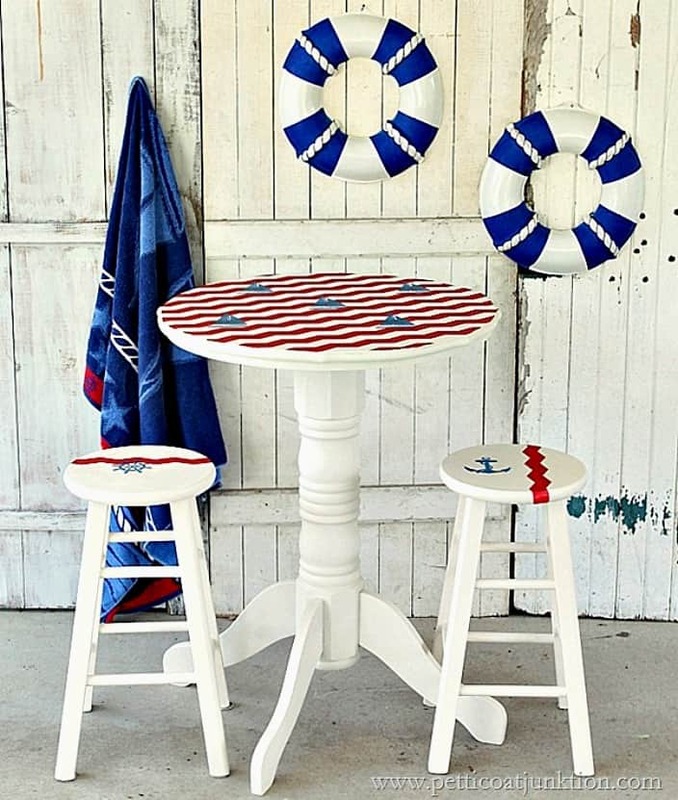 It would be so great at a beach house for sure, or even just on a regular patio/deck. 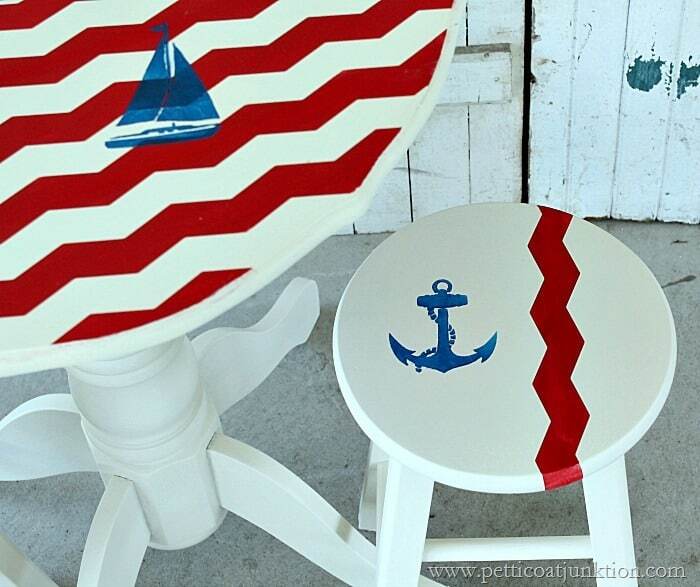 They’re all great but I do love the nautical theme of yours with appropriate colors, so clean and fresh looking. Did you use a stencil on table/stools or should I just wait to see post showing how you did them? How did you make life preserver rings also? I’ll be looking for something to make a table like that now. I have 4 stools out in back been waiting for light bulb moment to decide what I want to do with them. A table like that with stools for deck would be so nice. Think I’ll have hubs figure out a way to put some kind of back on them. Going to put your post in my favorites so I can refer back to it. Have to get my pinterest page back to work again, had some kind of fluke that took bunch of things out of my pc? Have no idea what happened, it’s like somebody got hold of it and decided to play nasty tricks on me and since I’m extremely digitally challenged I have to be in right frame of mind to tackle things. Right now I’m too busy making fabric banners for July 4th, lots more fun. Enjoy your blog, projects you do. Oh my goodness, Cathy! This is such a huge transformation! Beautiful job! Thanks Christy. I’m really happy with the way it turned out. Love this set! I just did 2 barstools like yours with an anchor on each one. Maybe I can find a table to go with…thanks for posting. Thank you. Hope you find a table! I adore this and think it’s my favorite of all of your projects that I’ve seen. The design pops against the white! Thanks Paula, It’s on my favorite list too!